There are a limited number of verifiable truths regarding Gunther. Among these are his constant presence in the vicinity of Jessie; the two are seldom far apart, and where one is, the other will surely be at least relatively near. He is a stout man, well above average in height, mass, and overall musculature. He has a cybernetic right arm, which seems to have capabilities not fully documented or understood even by the Solar Consortium. What is certain is that Gunther seems to have an unprecedented ability to directly interface with a variety of computer systems and machines. Reports on his behavior define him as an extreme variety of introvert, with no patience or tolerance for all but the most absolutely necessary social interactions. His only observed activity, when not engaged in some nefarious deeds with Jessie, is study, and tinkering with machinery. His surname, Derstag, doesn’t correspond to any living persons in the System, thus feeding speculation that he is either the last person to have this name, or by some means his record on file is the victim of negligence or sabotage. 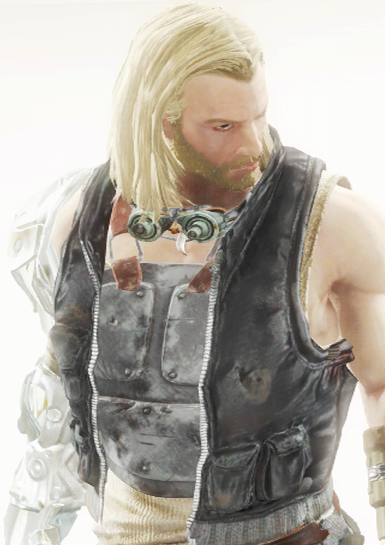 Gunther’s appearance as of this entry is simulated using the Terran Common Era simulation, Fallout 4, and is a reasonably approximate likeness as of 200 A.T.